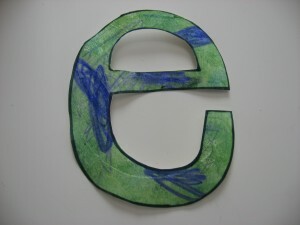 Earth Day is coming up so to extend our learning about the earth into our regular letter of the week craft we made an earth e today. 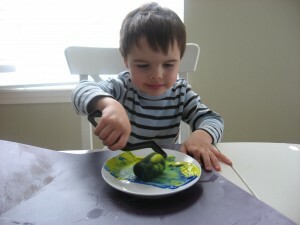 My son loves this paint roller and for a craft like this where you cover over crayon it was the perfect painting tool. 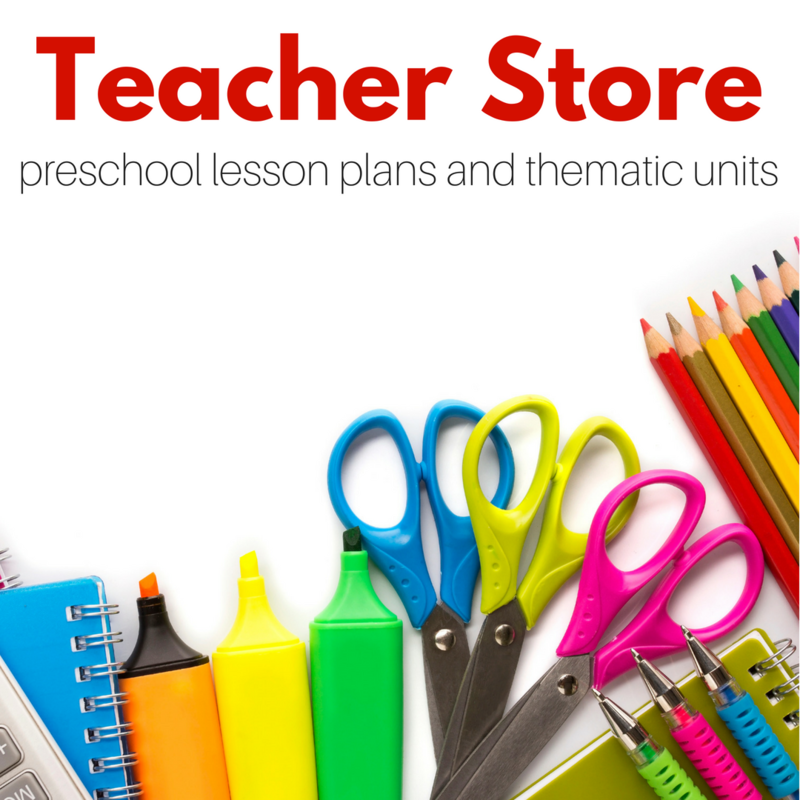 I couldn’t narrow down my books to just 3 today, they range from toddler to school age so there is something for everyone. Gather your materials. 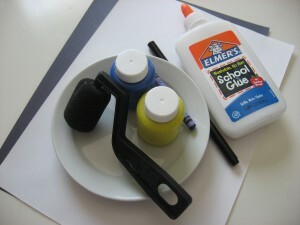 You will need some white construction paper ( or paper plate), another sheet for the backing, a blue crayon, a black marker, green ( or yellow and blue) paint,scissors , glue, a dish and a paint brush or roller. 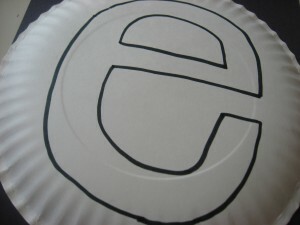 Start by writing a lowercase e on your white paper. 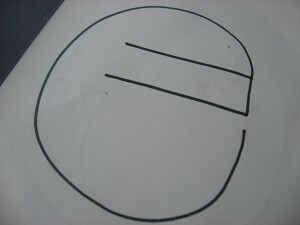 If you are me fail miserably, try again on the other side ( yes this is a picture of my better e). Still mess it up. 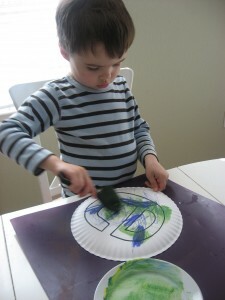 Grab a paper plate because that was your last sheet of white construction paper, make a stencil and trace it on the paper plate. 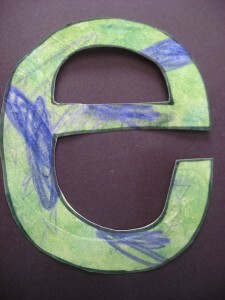 Give your child the blue crayon and explain that this e is the Earth ( show them pictures of the earth if need be to explain how the blue is the ocean and the green is the land). Have them draw some ocean- make sure they press hard. Now mix it. I prefer to do this than use the regular green if possible. It’s some extra fun and extra learning. 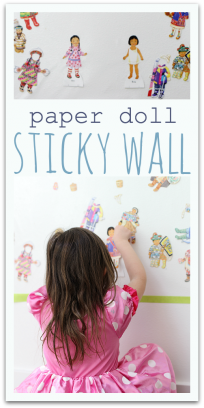 Glue on your backing paper. 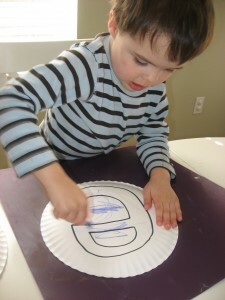 For more letter of the week crafts check out my eBook Alphabet Crafts ! 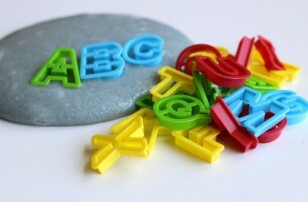 From A-Z you will be learning and creating with your child . 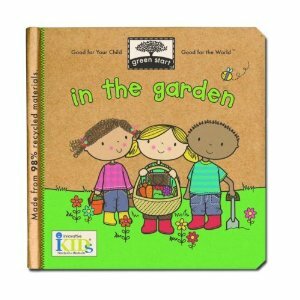 In the Garden by Leslie Bockol is a little board book all about growing your own fruits and vegetables in your garden. It is simple and although it’s listed for 3-6 year olds I would read it to 1-3 year olds. 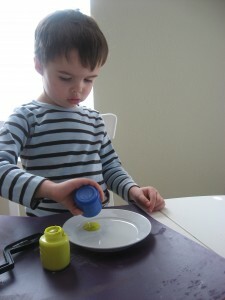 It identifies a number of fruits and vegetables and completes each page with ” I pick it and eat it!” my son loved the repetition and quickly completed each page for me while I was reading it to him. I think it’s a perfect book for toddlers and young preschoolers to introduce gardening to them. 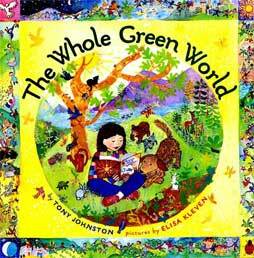 The Whole Green World by Tony Johnston was an unexpected hit with my son. Today reading it he learned that you can’t judge a book by it’s cover, he saw the book in our pile to read and wasn’t taken with it, but I suggested maybe just reading the first page and he was hooked. The book is really about appreciating the whole world, from the view point of a little girl who grabs some seeds, plants them , waters them and savors the beauty all around her. My son loved the sing song text and the ultra detailed illustrations by Elisa Kleven. Which my son would study with every turn of the page asking me ” Mommy which bird, which book, which cake is your favorite?” making reference to the illustrations . It was a wonderful book to snuggle up with ! 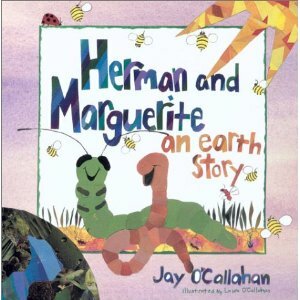 Herman and Marguerite: An Earth Story by Jay O’Callahan is a funny story with interesting and sometimes unexpected illustrations. 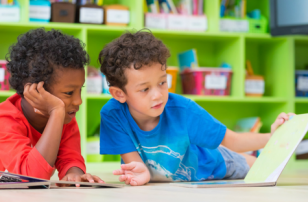 The story is about a worm who has heard about the orchard above and wants to see it, but the sun is threatening and he is saved by a caterpillar! They develop a friendship and because of it the orchard that was once barren starts attracting animals again. It’s not all easy along the way and the worm gets to return the favor of saving the caterpillar when she gets stuck between rocks on her way to spin her chrysalis. When she emerges as a butterfly her worm friend is there and so is a beautiful flowering apple orchard! My son liked this book , I found it somewhat disjointed and what we both thought was odd was the random inclusion of photos of the author throughout the book. “Who is that weird guy Mama?” I wasn’t sure how to answer that one. Still he sat for the whole thing, and learned just how important worms are. It won’t be renewed over and over from the library though. 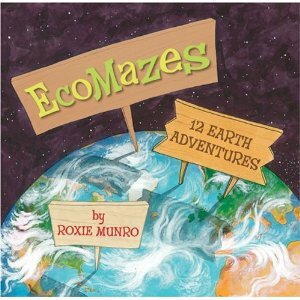 EcoMazes by Roxie Munro is a new book that was sent to me by the publisher for review. The idea of this book is to showcase different ecosystems like wetlands, the tundra, desert and more through both a maze and search and find game. This book is not designed for preschoolers although my son loves it. We do the maze together as that is far too complicated for him, but he loves to find the animals on each page and has learned a lot about them too. What is awesome for older children ( 7-10) is that along with an answer key to the maze and pictures there is a full page of information about each ecosystem in the back of the book. This doesn’t talk down to the reader and gives great information using sophisticated vocabulary. I am excited to see how this book’s use changes over time in my home. Very cool Elissa did you blog about it? Add the link if you did ! as usual, great book suggestions! Herman and Marguerite: An Earth Story- cool! .-= Jen´s last blog ..Last Day for my Giveaway! =-. Thanks so much for your wonderful blog. 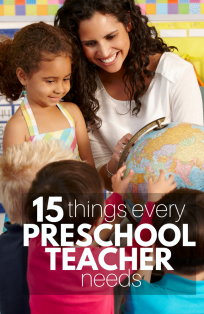 I check it daily for ideas for my 2yr old and 5yr old both. 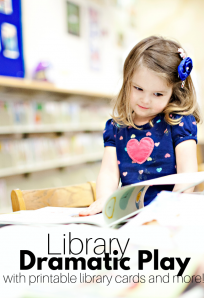 I just put a hold on those books at my library – looking forward to reading them with the kids!! 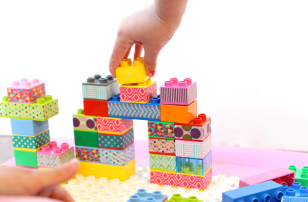 No blog – I’ve pretty much given that up! 🙂 But it is on my FB page -I shared the link to my “little letters” folder on your pagea few weeks back. I like the idea of the shape game. Thanks for sharing! Hello, Neat post. There is an issue together with your site in internet explorer, may check this? IE still is the market leader and a large component of other folks will pass over your excellent writing due to this problem.